Boston : Carter and Hendee, 1830-01-01. Hardcover. Good. Octavo. viii, 51 pages 19 cm. Original boards, later cloth reback. Soiling and minor staining to boards. Contemporary signature of Mrs. Waldo T. Pierce, 1831. Occasional spotting, minor toning, marginal dampstain. Scattered pencil marginalia. 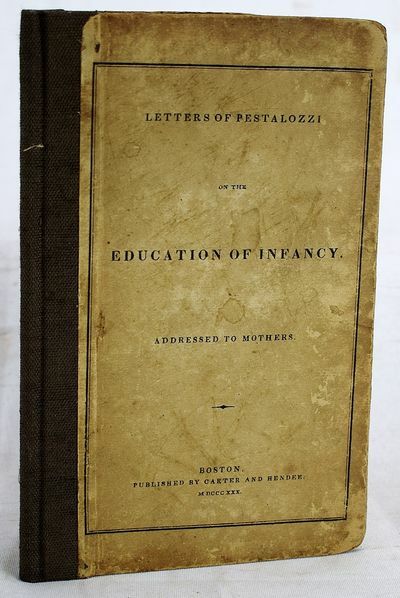 A new translation of Pestalozzi's letters addressed to J.P. Greaves, omitting both the date and Greaves from the address. This American edition has 9 letters of the 34 contained in the 1827 English edition.